Imperial Restrooms is one of the largest, most experienced sanitation companies specializing in Mobile Restroom Trailer Rentals, Shower Trailer Rentals in Porta Potty Rentals in Ohio. 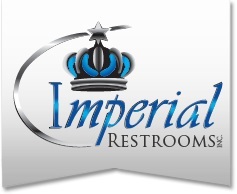 For over 15 years, Imperial Restrooms has been helping event planners by providing peace of mind with a simplistic business model for ease of transacting as well as providing the finest, most elegant mobile restroom trailer rentals throughout the state of Ohio. The Imperial team pride themselves on providing the highest quality restroom/shower trailer rentals coupled with first-in-class customer service including maintaining the bathroom/shower trailers, restocking toilet paper, soap and hand sanitizer and even cleaning the bathroom floors when necessary. Imperial Restrooms provides the lowest rates for restroom trailer rentals for weddings, town fairs, festivals, 5K Races, sporting events, soccer tournaments, parades, campgrounds, highway rest areas, military training operations, colleges, universities, hospitals, nursing homes, group homes, carnivals, municipalities, city/town government locations, commercial office buildings as well as Emergency Restroom/Shower Trailer Rentals in Ohio. Imperial Restrooms is one of the largest, most trusted restroom trailer rental companies in Ohio specializing in sanitary equipment rentals including portable bathroom trailer rentals, mobile shower stall trailers and porta potty rentals in the state of Ohio. A Luxury Restroom Trailer Rentals adds the comfort and convenience of home to any outdoor event where running water and electricity may be scarce. 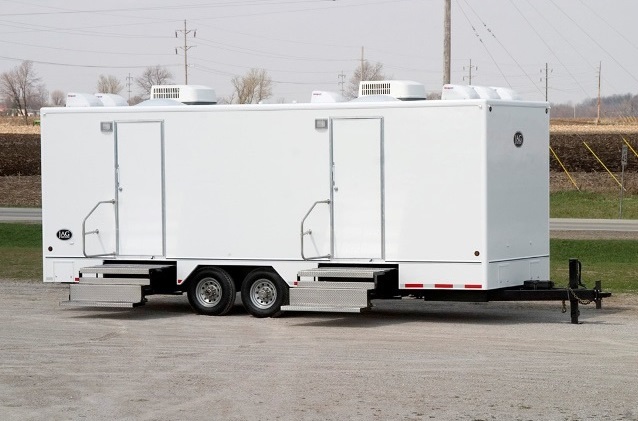 Imperial Restroom Trailers are perfect for weddings, concerts, sporting events, races, outdoor events, fairs, festivals and corporate outings throughout the state of Ohio. Imperial Restrooms provides restroom trailers and porta potty rentals for home and commercial building construction, remodeling and renovations in Ohio. Imperial Restroom Inc has one of the most versatile fleets of high end luxury portable restroom trailer rentals, mobile bathroom/shower trailer rentals and a large stock of porta potty rentals for large outdoor events with a need for high capacity lavatories in areas where facilities may be inaccessible or non-existent. The Restroom Trailers are heated/air conditioned and have the ability to run from an electric generator in areas where electricity and running water are inaccessible. Imperial Restrooms provides daily, weekly and monthly restroom/shower trailer rentals as well as long term bathroom trailer rentals. Imperial Restrooms are exquisitely designed and area equipped with facilities and amenities such as Vessel Sinks, Corian Countertops, TV's, DVD Players, AM/FM Radio and CD Players, Speakers, Heating and Air Conditioning Systems, Privacy Stalls, Hot/Cold Running Water, Soap Dispensers, Trash Receptacles, Vanity Mirrors, Men's & Women's separate restrooms for privacy. Call Imperial Restrooms for a Free Phone Consultation Regarding Sanitary Needs For Your Special Event To Be a Success! 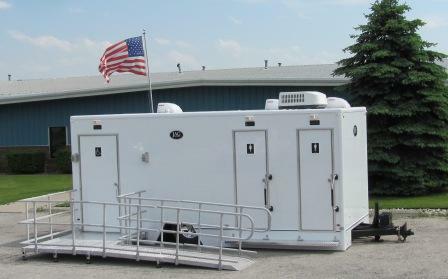 Call Now For The Most Elegant Restroom Trailer Rentals in Ohio!